MYB Textiles houses the world's only Nottingham Lace design team. This coupled with their specialist knowledge of Scottish Madras makes MYB an industry world leader. 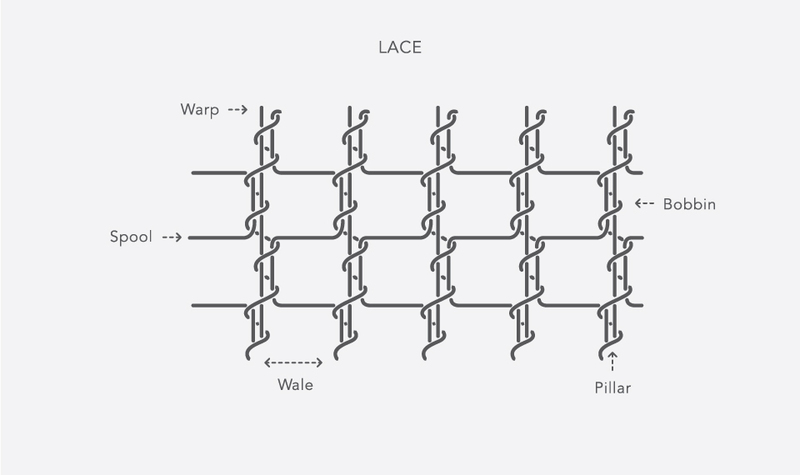 'Nottingham Lace' acknowledges the origin of the loom only, not the final lace product. All MYB fabrics are designed and produced at their mill in Ayrshire, Scotland. Over the years, MYB Textiles has invested heavily in design technology and modernisation to meet the needs of the evolving marketplace. 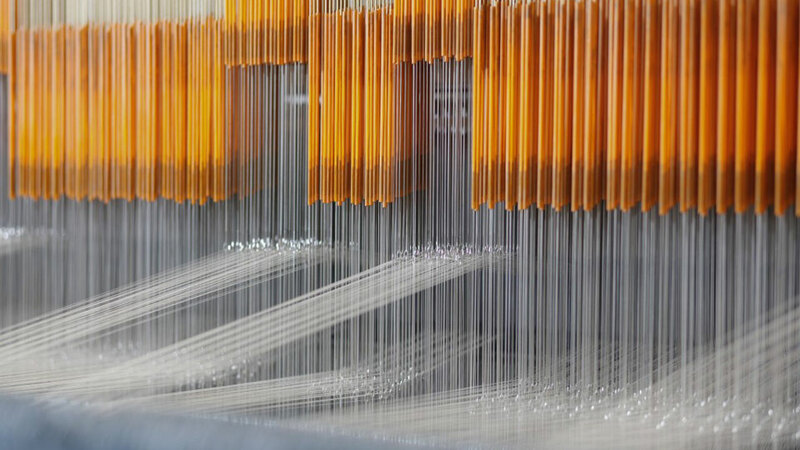 In addition to the range of traditional Madras and Nottingham Lace looms, the company has recently harnessed 100 year old looms with electronic jacquards. This innovation enables the transfer of design information from CAD systems in the design office direct to the looms, providing a remarkable efficiency in product development and order lead time. Thanks to this capability, the creative in-house design team often work in collaboration with client-based designers on bespoke projects, using their expertise to deliver a completely unique product to the client. 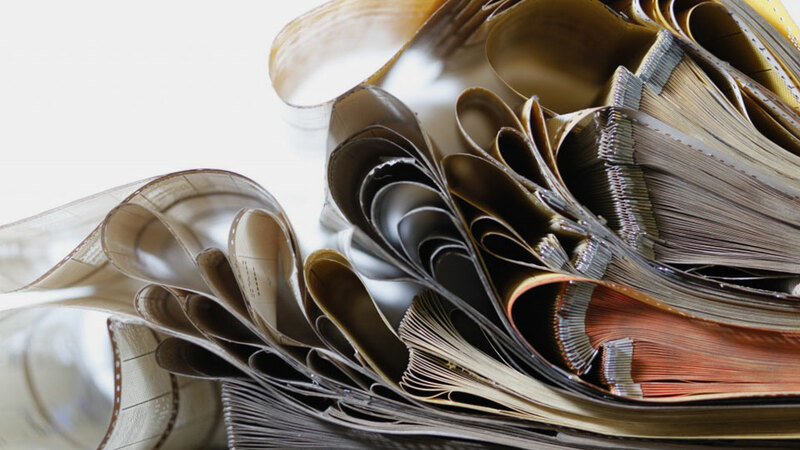 Projects in the past have involved translating metalwork to lace, recreating archive museum textiles and collaborations with design studios such as Timorous Beasties and Eley Kishimoto. As most MYB fabrics are sourced from original archive drawings, they are able to supply historically accurate designs for many film and television productions. 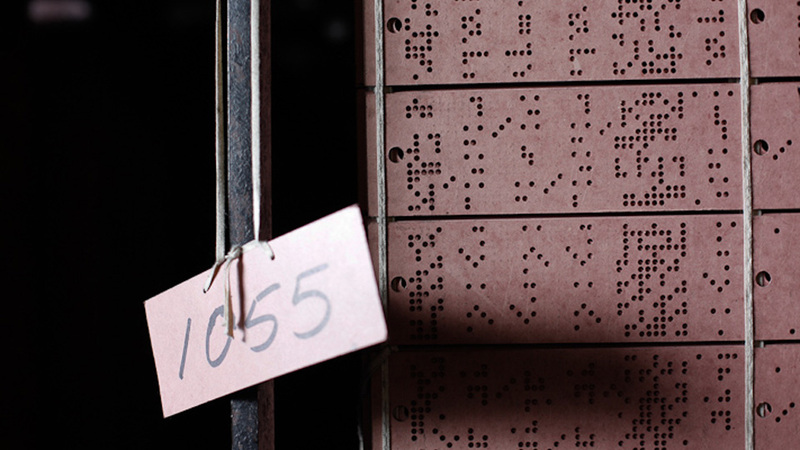 Failing the discovery of an exact time period match amongst the MYB collections, exclusive pieces are often created. The team have immediate access to the mill’s own 100 year old design archive, which consists of over 50,000 original pieces of cloth and drawings covering every period of art and design in that time. In addition, the design archives of several other local mills were purchased when they closed, collectively containing an additional 20,000 original designs. This contributes greatly to the wealth of knowledge and capability of the design team. MYB Textiles are recognised worldwide for their commitment to the highest quality of production – driven by continual product and design innovation, new technology and a highly skilled workforce. This enables MYB to supply both volume and small runs of bespoke designs quickly, whilst maintaining the highest quality standards in the industry. The skills prevalent in the creation of any piece of fabric produced in the mill are passed on from generation to generation through apprenticeships. The techniques used are so tailored to tradition that they can only be taught in-house, a teaching process vital to the survival of MYB. Innovation is a vital component of MYB and their vision for going forward. Their most recent development is a collection of inherently flame retardant products manufactured on the Scottish Madras Loom and certified by Trevira CS. This now opens the company up to the contract and hospitality market. The mill specialises in production using predominantly natural fibres. The lace product lends itself well to the use of pure cotton yarns and MYB prides itself on the minimal use of polyester: only 5% in any given piece of Scottish Lace. Lace is available in a number of qualities: 8, 10, 12 and 14 point. The figure details the number of vertical threads per inch. The higher this figure, the more delicate and detail-capable it is. The mill stocks a comprehensive bank of yarns from cotton and cotton chenille to wool, lambswool, linen and silk. Man Made fibres such as viscose and Lurex are also stocked for use in the Scottish Madras product. Madras is a clipped face sheer fabric with a 100% cotton twisted gauze ground weave. This is distinctive from any other plain weave as the twist makes the ground much less liable to slip. The design is woven into the ground by using the Jacquard patterning mechanism.Various yarns can be implemented within the pattern to create an array of effects. 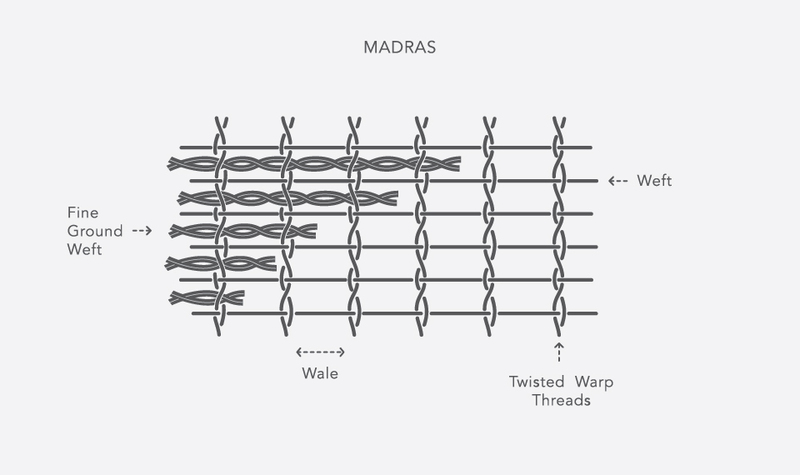 Having noticed a demand for high quality, inherently flame retardant sheer fabrics, MYB Textiles have researched and developed an impressive range of madras fabrics using certified Trevira CS yarns. MYB have spent over 4 years developing their Trevira capabilities to ensure they are offering the best quality solution to complement current high quality natural fibre products. Existing Trevira CS collections are generally plain weaves, stripes and simple patterns. MYB can now offer something completely unique and innovative to the contract furnishings market. Several design suggestions are shown above however MYB can offer almost any of their Madras fabric designs in the Trevira quality. In addition to their own designs, a bespoke design service is on offer, where clients can opt for a custom design to be made in a Trevira CS solution. The Trevira fabrics are all made to order and are available in up to 300cm width with a turnaround time of 1‐2 weeks for sampling and approx. 8 weeks for production. All articles have been tested according to DIN 4102 part 1 and qualify for class B1. Trevira CS curtains meet the requirements of class 1 according to EN 13773. Certificate OTI No. 44317. They meet also the requirements according to British Standard BS 5867 part 2 type C.
If you have any questions, please do not hesitate to contact MYB directly on +44 (0) 1560 321210.